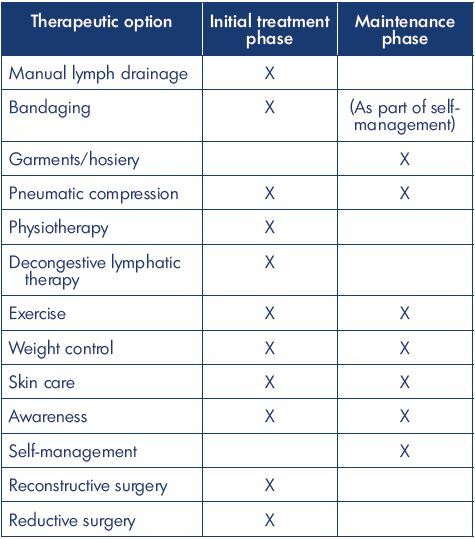 Chronic lymphedema can be managed effectively using a sequenced and targeted treatment program based on decongestive lymphatic therapy (DLT) with compression therapy and surgery (mostly as an adjunct to DLT). In the maintenance phase, DLT is carried out using the proper combination of compression garments, meticulous personal hygiene and skin care, self-massage based on the principle of manual lymphatic drainage (if applicable), and exercises and activities to promote lymph transport. Pneumatic compression devices/therapy can be applied at home, if desired. When conservative treatment based on DLT fails or delivers suboptimal outcomes, the patient may need additional surgical interventions, either reconstructive or ablative, where applicable. These two surgical therapies are more effective in terms of outcomes when combined postoperatively with manual lymphatic drainage–based DLT. A long-term commitment to postoperative DLT, especially compression therapy, is a critical factor in determining the success of either reconstructive or palliative surgery. Recently, several causal genetic mutations have been identified among primary lymphedema syndromes, which provide possible opportunities for future molecular interventions. This new prospect of gene-oriented management is more promising as a molecular therapy for both primary and acquired lymphedema. Table I. Guidelines 6.3.0 of the American Venous Forum on lymphedema: medical and physical therapy. Manual lymphatic drainage–based decongestive lymphatic therapy remains a main treatment for the contemporary management of lymphedema.28-31 Further improvements in function and quality of life can be achieved with lifestyle modifications, including specific exercise regimens.32 In addition, incorporating intermittent pneumatic compression may significantly reduce edema and symptoms (Figure 2).33,34 Currently, pharmacological interventions have little applicability in the management of lymphedema35-37; however, antibiotic therapy is necessary for the effective control of infections,38-40 and both growth factor–based and cellular therapies (ie, molecular modifications) continue to show great promise for the future.41-43 During the last 10 years, the use of surgery for lymphedema has increased, mostly by using newly developed/incorporated techniques for both reconstructive (Figure 3)44,45 and excisional (Figure 4)46,47 surgery. Figure 1. Chronic lymphedema at an advanced stage. with recurrent infection/sepsis, the disease is steadily progressing toward a disabling and distressing condition. Panels C and D.
well as immunodeficiency and malignancy. Figure 2. Clinical case of decongestive lymphatic therapy management. Panel A. Progressive lymphedema condition with recurrent episodes of sepsis before decongestive lymphatic therapy is instituted. lymphatic therapy with decreased dermal backflow that is compatible with clinical improvement (1-year follow-up assessment). Figure 3. Clinical case of reconstructive surgery. Figure 4. Clinical case of excisional/debulking surgery. The main treatment goals are to improve the physical condition of the affected limb or area and the patient’s quality of life,48,49 which, despite a psychologically unacceptable physical deformity, will ultimately improve the patient’s social life, functional and psychological state, and the ability to perform normal physical activities, so they can return to a normal or near-normal life. Decongestive lymphatic therapy is a nonsurgical treatment option to reduce swelling and maintain this reduction over the long term. This method uses compression, massage, and exercise to stimulate lymphatic drainage, which will reduce the swelling, soften the fibrotic tissues, and ultimately improve limb function and mobility. As skin is a barrier to infections, improving its function will reduce the rate and severity of cellulitis (Figure 2).70-73 Decongestive lymphatic therapy is a well-established treatment option for the management of lymphedema. It is an empirical strategy to control edema and it remains the treatment of choice regardless of the disease etiology (primary or secondary) or clinical stage and despite the fact that it is not a cure. Compression therapy with bandages, garments, and intermittent pneumatic compression and manual lymphatic drainage are two major components of decongestive lymphatic therapy.71,72 Indeed, compression bandage– based therapy is the single most important component of decongestive lymphatic therapy with or without sequential intermittent pneumatic compression–based mechanical compression.74-77 However, basic hygienic care of the skin, movement exercises, and education for risk reduction, including the prevention of infections, are also essential components of the treatment regimen. Table II. Useful lymphedema interventions. International Publishing AG 2011, 2018; 540. There are a few contraindications to each component of decongestive lymphatic therapy, including acute erysipelas, acute thrombophlebitis, phlebothrombosis, decompensated heart failure, and stage IV peripheral artery occlusive disease. High pressure bandaging is risky for any patient with advanced peripheral arterial disease of the limb or advanced cardiac failure. Manual lymphatic drainage uses a massage technique to reroute the accumulated lymph in the swollen region through collateral lymphatic pathways to an area where the lymph can drain normally. The initial step of the process is to decongest the central/proximal areas to make room before massaging the edematous regions. The manual lymphatic drainage massage is an important component of decongestive lymphatic therapy, especially for midline lymphedema treatment where there are few alternatives70; however, it should not be used alone as a sole independent regimen, but rather as one part of the decongestive lymphatic therapy. Indeed, manual lymphatic drainage has not yet been confirmed scientifically with objective data, although it has remained an indispensable component of decongestive lymphatic therapy for decades.84,85 Therefore, depending on local resources, manual lymphatic drainage may be included in the treatment plan despite the lack of evidence for long-term benefits. Compression hosiery/stockings are made for the maintenance phase to maintain the effect achieved through the initial intensive treatment phase. Fitted garments with higher compression classes (30 to 40 mm Hg) are ideal, but they become a limiting factor, especially in patients with advanced age, obesity, and/or arthritis. patient and the stage of the lymphedema. Recent data show that the hepatotoxic effects of coumarin (5, 6, benzo-α-pyrone), which prohibit its use for the treatment of lymphedema, are a consequence of a genetic and metabolic problem relating to the breakdown of coumarin.105 A new test that screens for genetic polymorphisms can identify people who have a functional, nonpolymorphic cytochrome P450 2A6 (CYP2A6) enzyme, a liver enzyme responsible for the metabolism of coumarin to noncytotoxic metabolites.106 A better understanding of genetics and genomics will help determine which patients will respond well and overcome the adverse outcomes; this new pharmacogenomic test106 helps limit the use of benzopyrones (particularly coumarin) to those patients with a functional, nonpolymorphic CYP2A6 enzyme to reduce the risk of hepatic toxicity. Figure 5. Clinical case of infection resulting in cellulitis. in-hospital intensive care with the antibiotics. Inhibition of transforming growth factor β (TGFβ) expression improved lymphatic function by diminishing inflammation, the migration of T helper 2 type (Th2) cells, and the expression of profibrotic Th2-type cytokines.41 Hence, proper inhibition of lymphangiogenesis by Th2-type cytokines is considered a potent means of improving lymphangiogenesis by manipulating the antilymphangiogenic pathways.42 Also, excessive generation of immature lymphatic vessels, which are essential for the pathogenesis and maintenance in lymphedema, is dependent upon an interaction between CD4 and macrophages, and lymphedema can be improved by inhibiting the activation of T helper 1 type and T helper 17 type cells.43 These two lines of investigation show a promising future for pharmacological approaches to improve the treatment and prevention of lymphedema. 3. Lee BB. 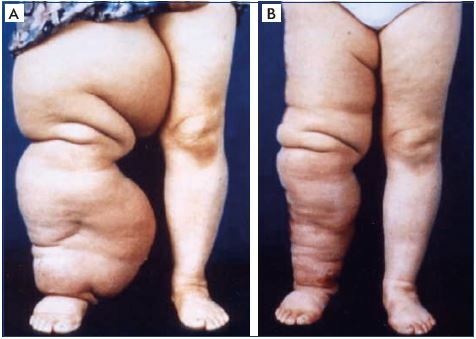 Lymphedema-angiodysplasia syndrome: a prodigal form of lymphatic malformation. Phlebolymphology. 2005;47:324-332. 4. Lee BB, Kim YW, Seo JM, et al. Current concepts in lymphatic malformation. Vasc Endovasc Surg. 2005;39(1):67-81. 5. Lee BB, Kim DI, Whang JH, Lee KW. Contemporary issues in management of chronic lymphedema – personal reflection on an experience with 1065 patients. Commentary. Lymphology. 2005;38:28-31. 6. Lee BB. Contemporary issues in management of chronic lymphedema: personal reflection on an experience with 1065 patients. Lymphology. 2005;38(1):28-31. 7. Lee BB, Antignani PL, Baroncelli TA, et al. 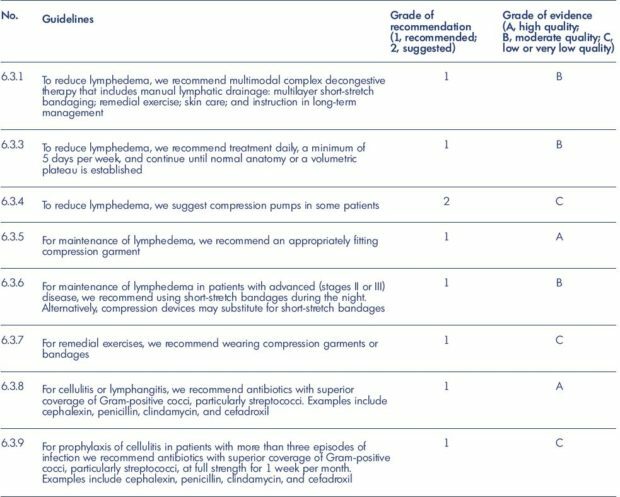 IUA-ISVI consensus for diagnosis guideline of chronic lymphedema of the limbs. Int Angiol. 2015;34(4):311-332. 8. Lee BB, Laredo J. Pathophysiology of primary lymphedema. In: Neligan PC, Piller NB, Masia J, eds. Complete Medical and Surgical Management. Boca Raton, FL: CRC Press; 2016:177-188. 9. Lee BB, Villavicencio JL. Primary lymphoedema and lymphatic malformation: are they the two sides of the same coin? Eur J Vasc Endovasc Surg. 2010;39(5):646-653. 10. Lee BB, Laredo J, Neville R. Primary lymphedema as a truncular lymphatic malformation. In: Lee BB, Bergan J, Rockson SG, eds. Lymphedema: A Concise Compendium of Theory and Practice. 1st edition. London, UK: Springer-Verlag; 2011:419-426. 11. Guyatt G, Gutterman D, Baumann MH, et al. Grading strength of recommendations and quality of evidence in clinical guidelines. Chest. 2006;129(1):174-181. 12. Guyatt GH, Oxman AD, Vist GE, et al; GRADE Working Group. GRADE: an emerging consensus on rating quality of evidence and strength of recommendations. BMJ. 2008;336(7650):924-926. 13. Gamble GL, Cheville A, Strick D. Lymphedema: medical and physical therapy. In: Gloviczki P, ed. Handbook of Venous Disorders: Guidelines of the American Venous Forum. 3rd edition. London, UK: Hodder Arnold; 2009:655. 14. Mortimer PS. Therapy approaches for lymphedema. Angiology. 1997;48(1):87- 91. 15. Földi E. The treatment of lymphedema. Cancer. 1998;83(12):2833-2834. 16. Leduc O, Leduc A, Bourgeois P, Belgrado JP. The physical treatment of upper limb edema. Cancer. 1998;83(12):2835-2839. 17. Szolnoky G, Lakatos B, Keskeny T, et al. Intermittent pneumatic compression acts synergistically with manual lymphatic drainage in complex decongestive physiotherapy for breast cancer treatment-related lymphedema. Lymphology. 2009;42(4):188-194. 18. Lee BB, Kim YW, Kim DI, Hwang JH, Laredo J, Neville R. Supplemental surgical treatment to end stage (stage IV-V) of chronic lymphedema. Int Angiol. 2008;27(5):389-395. 19. Lee BB, Laredo J, Neville R. Reconstructive surgery for chronic lymphedema: a viable option, but. Vascular. 2011;19(4):195- 205. 20. Baumeister RG, Siuda S. Treatment of lymphedemas by microsurgical lymphatic grafting: what is proved? Plast Reconstr Surg. 1990;85(1):64-74. 21. Campisi C, Boccardo F, Zilli A, Maccio A, Gariglio A, Schenone F. Peripheral lymphedema: new advances in microsurgical treatment and long-term outcome. Microsurgery. 2003;23(5):522-525. 22. Levick JR, Michel CC. Microvascular fluid exchange and the revised Starling principle. Cardiovasc Res. 2010;87(2):198-210. 23. Wiig H, Swartz MA. Interstitial fluid and lymph formation and transport: physiological regulation and roles in inflammation and cancer. Physiol Rev. 2012;92(3):1005-1060. 24. Joh JH, Lee BB, Chun YS, Chung WK, Lee HY. Angiosarcoma after excisional surgery for chronic lymphedema. J Vasc Surg Venous Lymphat Disord. 2016;4(3):336-339. 25. Lee BB, Bergan JJ. New clinical and laboratory staging systems to improve management of chronic lymphedema. Lymphology. 2005;38(3):122-129. 26. Lee BB. Classification and staging of lymphedema. In: Tredbar LL, Morgan CL, Lee BB, Simonian SJ, Blondeau B, eds. Lymphedema: Diagnosis and Treatment. London, UK: Springer; 2008:21-30. 27. International Society of Lymphology. The diagnosis and treatment of peripheral lymphedema: 2013 consensus document. 2013;46(1):1-11. 28. Casley-Smith JR, Mason MR, Morgan RG, Casley-Smith JR. Complex physical therapy of the lymphedematous leg. Int J Angiol. 1995;4(3):134-142. 29. Johansson K, Albertsson M, Ingvar C, Ekdahl C. Effects of compression bandaging with or without manual lymph drainage treatment in patients with postoperative arm lymphedema. Lymphology. 1999;32(3):103-110. 30. Szolnoky G, Mohos G, Dobozy A, Kemény L. Manual lymph drainage reduces trapdoor effect in subcutaneous island pedicle flaps. Int J Dermatol. 2006;45(12):1468-1470. 31. Kasseroller RG. The Vodder School: the Vodder method. Cancer. 1998;15(83):2840-2842. 32. Schmitz KH, Ahmed RL, Troxel A, et al. Weight lifting in women with breastcancer- related lymphedema. N Engl J Med. 2009;361(7):664-673. 33. Zelikovski A, Haddad M, Reiss R. The “Lympha-Press” intermittent sequential pneumatic device for the treatment of lymphoedema: five years of clinical experience. J Cardiovasc Surg. 1986;27(3):288-290. 34. Dittmar A, Krause D. A comparison of intermittent compression with single and multi-chamber systems in treatment of secondary arm lymphedema following mastectomy [article in German]. Z Lymphol. 1990;14(1):27-31. 35. Rockson SG, Miller LT, Senie R, et al. American Cancer Society Lymphedema Workshop. Workgroup III: diagnosis and management of lymphedema. Cancer. 1998;83(12):2882-2885. 36. Ramelet AA. Pharmacologic aspects of a phlebotropic drug in CVI-associated edema. Angiology. 2000;51(1):19-23. 37. Hoult JR, Paya M. Pharmacological and biochemical actions of simple coumarins: natural products with therapeutic potential. Gen Pharmacol. 1996;27(4):713-722. 38. Gabillot-Carré M, Roujeau JC. Acute bacterial skin infections and cellulitis. Curr Opin Infect Dis. 2007;20(2):118- 123. 39. Dreyer G, Medeiros Z, Netto MJ, Leal NC, de Castro LG, Piessens WF. Acute attacks in the extremities of persons living in an area endemic for bancroftian filariasis: differentiation of two syndromes. Trans R Soc Trop Med Hyg. 1999;93(4):413-417. 40. Jamal S, Manokaran G, Tripathi FM, Zaleska M, Stelmach E, Olszewski WL. The effectiveness of long-acting penicillin (penidur) in preventing recurrences of dermatolymphangioadenitis (DLA) and controlling skin, deep tissues, and lymph bacterial flora in patients with “filarial” lymphedema. Lymphology. 2005;38:66- 80. 41. Avraham T, Daluvoy S, Zampell J, et al. Blockade of transforming growth factor-β1 accelerates lymphatic regeneration during wound repair. Am J Pathol. 2010;177(6):3202-3214. 42. Savetsky IL, Ghanta S, Gardenier JC, et al. Th2 cytokines inhibit lymphangiogenesis. PLoS One. 2015;10(6):e0126908. 43. Ogata F, Fujiu K, Matsumoto S, et al. Excess lymphangiogenesis cooperatively induced by macrophages and CD4+ T cells drives the pathogenesis of lymphedema. J Invest Dermatol. 2016;136(3):706-714. 44. Lee BB, Laredo J, Neville R. Current Status of lymphatic reconstructive surgery for chronic lymphedema: it is still an uphill battle! Int J Angiol. 2011;20(2):73-79. 45. Lee BB, Laredo J, Neville R: Current dilemma with controversy. In: Lee BB, Bergan J, Rockson SG, eds. Lymphedema: a Concise Compendium of Theory and Practice. 1st edition. London, UK: Springer-Verlag; 2011:381-386. 46. Kim DI, Huh SH, Hwang JH, Joh JH. Excisional surgery for chronic advanced lymphedema. Surg Today. 2004;34(2):134-137. 48. Coster S, Poole K, Fallowfield LJ. The validation of a quality of life scale to assess the impact of arm morbidity in breast cancer patients post-operatively. Breast Cancer Res Treat. 2001;68(3)273-282. 49. Dodd MJ, Miaskowski C, Paul SM. Symptom clusters and their effect on the functional status of patients with cancer. Oncol Nurs Forum. 2001;28(30:465- 470. 50. Michelini S, Failla A, Moneta G, Zinicola V, Romaldini, Puglisi D. International classification of lymphedema functioning and disability evaluation. Eur J Lymphology. 2007;17(51):16-19. 51. Brice G, Child AH, Evans A, et al. Milroy disease and the VEGFR-3 mutation phenotype. J Med Genet. 2005;42(2):98-102. 52. Gordon K, Schulte D, Brice G, et al. Mutation in vascular endothelial growth factor-C, a ligand for vascular endothelial growth factor receptor-3, is associated with autosomal dominant Milroy-like primary lymphedema. Circ Res. 2013;112(6):956-960. 53. Brice G, Mansour S, Bell R, et al. Analysis of the phenotypic abnormalities in lymphoedema-distichiasis syndrome in 74 patients with FOXC2 mutations or linkage to 16q24. J Med Genet. 2002;39(7):478-483. 54. Fang J, Dagenais SL, Erickson RP, et al. Mutations in FOXC2 (MFH-1), a forkhead family transcription factor, are responsible for the hereditary lymphedemadistichiasis syndrome. Am J Hum Genet. 2000;67(6):1382-1388. 55. Bull LN, Roche E, Song EJ, et al. Mapping of the locus for cholestasis-lymphedema syndrome (Aagenaes syndrome) to a 6.6-cM interval on chromosome 15q. Am J Hum Genet. 2000;67(4):994-999. 56. Ostergaard P, Simpson MA, Connell FC, et al. Mutations in GATA2 cause primary lymphedema associated with a predisposition to acute myeloid leukemia (Emberger syndrome). Nat Genet. 2011;43(10):929-931. 57. Alders M, Hogan BM, Gjini E, et al. Mutations in CCBE1 cause generalized lymph vessel dysplasia in humans. Nat Genet. 2009;41(12):1272-1274. 58. Ferrell RE, Finegold DN. Research perspectives in inherited lymphatic disease: an update. Ann N Y Acad Sci. 2008;1131:134-139. 59. Rockson SG. Lymphedema therapy in the vascular anomaly patient: therapeutics for the forgotten circulation. Lymphat Res Biol. 2005;3(4):253-255. 60. Szuba A, Cooke JP, Yousuf S, Rockson SG. Decongestive lymphatic therapy for patients with cancer-related or primary lymphedema. Am J Med. 2000;109(4):296-300. 61. Badger CM, Peacock JL, Mortimer PS. A randomized, controlled, parallelgroup clinical trial comparing multilayer bandaging followed by hosiery versus hosiery alone in the treatment of patients with lymphedema of the limb. Cancer. 2000;88(12):2832-2837. 62. Olszewski WL, Engeset A. Intrinsic contractility of prenodal lymph vessels and lymph flow in human leg. Am J Physiol. 1980;239(6):H775-H783. 63. Cheema BS, Kilbreath SL, Fahey PP, Delaney GP, Atlantis E. Safety and efficacy of progressive resistance training in breast cancer: a systematic review and meta-analysis. Breast Cancer Res Treat. 2014;148(2):249-268. 64. Brennan MJ, Miller LT. Overview of treatment options and review of the current role and use of compression garments, intermittent pumps, and exercise in the management of lymphedema. Cancer. 1998;83(12):2821- 2817. 65. Szuba A, Achalu R, Rockson SG. Decongestive lymphatic therapy for patients with breast carcinomaassociated lymphedema. A randomized, prospective study of a role for adjunctive intermittent pneumatic compression. Cancer. 2002;95(11):2260-2267. 66. Piller N, Thelander A. Treatment of chronic postmastectomy lymphedema with low level laser therapy: a 2.5 year follow-up. Lymphology. 1998;31(2):74-86. 67. Carati CJ, Anderson SN, Gannon BJ, Piller NB. Treatment of postmastectomy lymphedema with low-level laser therapy: a double blind, placebo-controlled trial. Cancer. 2003;98(6):1114-1122. 68. Jang DH, Song DH, Chang EJ, Jeon JY. Anti-inflammatory and lymphangiogenetic effects of low-level laser therapy on lymphedema in an experimental mouse tail model. Lasers Med Sci. 2016;31(2):289-296. 69. Ohkuma M. Treatment of peripheral lymphedema by concomitant application of magnetic fields, vibration and hyperthermia: a preliminary report. Lymphology. 2002;35(2):87-90. 70. Földi E, Földi M, Weissleder H. Conservative treatment of lymphoedema of the limbs. Angiology. 1985;36(3):171- 180. 71. Vodder E. Die manuelle lymphdrainage und ihre medizinischen anwendungsgebiete. Erfahrungsheilkunde. 1966;16. 72. Földi M, Strößenreuther R. Grundlagen der Manuellen Lymphdrainage. 4th edition. München, Germany: Elsevier; 2007. 73. Bernas M, Witte MH. Consensus and dissent on the ISL consensus document on the diagnosis and treatment of peripheral lymphedema. Lymphology. 2004;37(4):165-167. 74. Adams KE, Rasmussen JC, Darne C, et al. Direct evidence of lymphatic function improvement after advanced pneumatic compression device treatment of lymphedema. Biomed Opt Express. 2010;1(1):114-125. 75. Stout N, Partsch H, Szolnoky G, et al. Chronic edema of the lower extremities: international consensus recommendations for compression therapy clinical research trials. Int Angiol. 2012;31(4):316-329. 76. Hwang JH, Kim TU, Lee KW, Kim DI, Lee BB. Sequential intermittent pneumatic compression therapy in lymphedema. J Korean Acad Rehab Med. 1997;21(1):146-153. 77. Pflug JJ. Intermittent compression in the management of swollen legs in general practice. Lancet. 1975;215(1285):69-76. 78. Brunner U, Frei-Fleischlin C. Gegenwärtiger Stand der kombinierten physikalischen Entstauungstherapie beim primären und sekundären Lymphödem der Beine. VASA. 1993;Band 22(1). 79. Földi E, Baumeister RGH, Bräutigam P, Tiedjen KU. Zur diagnostik und therapie des lymphödems. Dtsch Ärztebl. 1998;95(13):A740-A747. 80. Mortimer P, Todd J. Lymphoedema: Advice on Self-management and Treatment. 3rd edition. Beaconsfield, Bucks, UK: Beaconsfield Publishers, LTD; 2007. 81. von der Weid PY, Rahman M, Imtiaz MS, van Helden DF. Spontaneous transient depolarizations in lymphatic vessels of the guinea pig mesentery: pharmacology and implication for spontaneous contractility. Am J Physiol Heart Circ Physiol. 2008;295(5):H1989-H2000. 82. Lauridsen MC, Christiansen P, Hessov I. The effect of physiotherapy on shoulder function in patients surgically treated for breast cancer: a randomized study. Acta Oncol. 2005;44(5):449-457. 83. Johansson K, Ingvar C, Albertsson M, Ekdahl C. Arm lymphoedema, shoulder mobility and muscle strength after breast cancer treatment? A prospective 2-year study. Adv Physther. 2001;3(2):55-66. 84. Devoogdt N, Van Kampen M, Geraerts I, Coremans T, Christiaens MR. Different physical treatment modalities for lymphoedema developing after axillary lymph node dissection for breast cancer: a review. Eur J Obstet Gynecol Reprod Biol. 2010;149(1):3-9. 85. Devoogdt N, Christiaens MR, Geraerts I, et al. Effect of manual lymph drainage in addition to guidelines and exercise therapy on arm lymphoedema related to breast cancer: randomised controlled trial. BMJ. 2011;343:d5326. 86. Moffatt C, Partsch H, Schuren J, et al; International Lymphedema Framework. Best practice for the management of lymphoedema – 2nd edition. Compression therapy: a position document on compression bandaging. http://www.lympho.org/portfolio/ compression-therapy-a-positiondocument- on-compression-bandaging/. Published 2012. Accessed January 26, 2018. 87. Partsch H, Stout N, Forner-Cordero I, et al. Clinical trials needed to evaluate compression therapy in breast cancer related lymphedema (BCRL). Int Angiol. 2010;29(5):442-453. 88. Partsch H, Damstra RJ, Mosti G. Dose finding for an optimal compression pressure to reduce chronic edema of the extremities. Int Angiol. 2011;30(6):527- 533. 89. Lamprou DA, Damstra RJ, Partsch H. Prospective, randomized, controlled trial comparing a new two-component compression system with inelastic multicomponent compression bandages in the treatment of leg lymphedema. Dermatol Surg. 2011;37(7):985-991. 90. Damstra RJ, Partsch H. Prospective, randomized controlled trial comparing the effectiveness of adjustable compression Velcro wraps versus inelastic multilayer compression bandages in the initial treatment of leg lymphedema. J Vasc Surg Venous Lymphat Disord. 2013;1(1):13-19. 91. Eliska O, Eliskova M. Are peripheral lymphatics damaged by high pressure manual massage? Lymphology. 1995;28(1):21-30. 92. Foeldi E. Massage and damage to lymphatics. Lymphology. 1995;28(1):1-3. 93. Blumberg SN, Berland T, Rockman C, et al. Pneumatic compression improves quality of life in patients with lowerextremity lymphedema. Ann Vasc Surg. 2016;30:40-44. 94. Zaleska M, Olszewski WL, Durlik M. The effectiveness of intermittent pneumatic compression in long-term therapy of lymphedema of lower limbs. Lymphat Res Biol. 2014;12(2):103-109. 95. Zaleska M, Olszewski WL, Cakala M, Cwikla J, Budlewski T. Intermittent pneumatic compression enhances formation of edema tissue fluid channels in lymphedema of lower limbs. Lymphat Res Biol. 2015;13(2):146-153. 96. 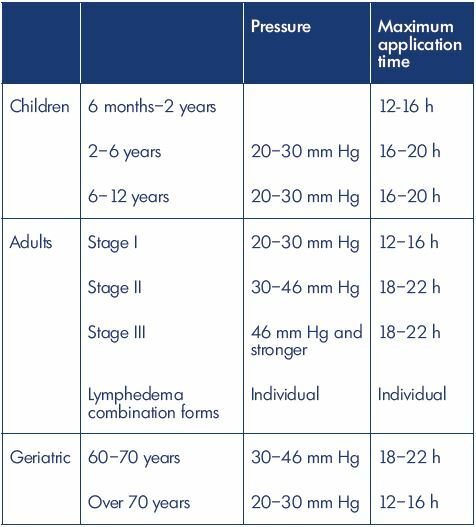 Olszewski WL, Jain P, Ambujam G, Zaleska M, Cakala M, Gradalski T. Tissue fluid pressure and flow during pneumatic compression in lymphedema of lower limbs. Lymphat Res Biol. 2011;9(2):77-83. 97. Mayrovitz HN. Interface pressures produced by two different types of lymphedema therapy devices. Phys Ther. 2007;87(10):1379-1388. 98. Compression for lymphoedema. Lancet. 1986;327(8486):896. 99. Cluzan RV, Alliot F, Ghabboun S, Pascot M. Treatment of secondary lymphedema of the upper limb with cyclo 3 fort. Lymphology. 1996;29(1):29-35. 100. Casley-Smith JR, Morgan RG, Piller NB. Treatment of lymphedema of the arms and legs with 5,6-benzo-[α]-pyrone. N Engl J Med. 1993;329(16):1158-1163. 101. Loprinzi CL, Kugler JW, Sloan JA, et al. Lack of effect of coumarin in women with lymphedema after treatment for breast cancer. N Engl J Med. 1999;340(5):346- 350. 102. Roztocil K, Pretovsky I, Olivia I. The effects of hydroethylrutosides on capillary filtration rate in the lower limbs of man. Eur J Clin Pharmacol. 1993;11(6):435- 438. 103. Clement DL. Management of venous edema: insights from an international task force. Angiology. 2000;51(1):13-17. 104. Moseley A, Piller N, Douglass J, Esplin M. Comparison of the effectiveness of MLD and LPG. J Lymphoedema. 2007;2(2):30-36. 105. Pecking AP, Fevrier B, Wargon C, Pillion G. Efficacy of Daflon 500 mg in the treatment of lymphedema (secondary to conventional therapy of breast cancer). Angiology. 1997;48(1):93-98. 106. Farinola N, Piller N. Pharmacogenomics: its role in re-establishing coumarin as treatment for lymphedema. Lymphat Res Biol. 2005;3(2):81-86. 107. Raunio H, Rautio A, Gullstén H, Pelkonen O. Polymorphisms of CYP2A6 and its practical consequences. Br J Clin Pharmacol. 2001;52(4):357-363. 108. Michelini S, Campisi C, Failla A, Boccardo F, Moneta G. Combination treatment of lymphedema. Our experiences [article in Italian]. Minerva Cardioangiol. 1998;46(10):395-396. 109. Campisi C, Boccardo F. Lymphedema and microsurgery. Microsurgery. 2002;22(2):74-80. 110. Olszewski WL. Episodic dermatolymphangioadenitis (DLA) in patients with lymphedema of the lower extremities before and after administration of benzathine penicillin: a preliminary study. Lymphology.1996;29(3):126-131. 111. Karonidis A, Chen HC. Preservation of toes in advanced lymphedema: an important step in the control of infection. Ann Plast Surg. 2010;64(4):446-450. 112. Celestin R, Brown J, Kihiczak G, Schwartz RA. Erysipelas: a common potentially dangerous infection. Acta Dermatovenerol Alp Panonica Adriat. 2007;16(3):123-179. 113. Olszewski WL. Episodic dermatolymphangioadenitis (DLA) in patients with lymphedema of the lower extremities before and after administration of benzathine penicillin: a preliminary study. Lymphology. 1996;29(3):126-131. 114. Singh R, Ray P, Das A, Sharma M. Role of persisters and small-colony variants in antibiotic resistance of planktonic and biofilm-associated Staphylococcus aureus: an in vitro study. J Med Microbiol. 2009;58(pt 8):1067-1073. 115. Tabibiazar R, Cheung L, Han J, et al. Inflammatory manifestations of experimental lymphatic insufficiency. PLoS Med. 2006;3(7):e254. 116. Nakamura K, Radhakrishnan K, Wong YM, Rockson SG. Anti-inflammatory pharmacotherapy with ketoprofen ameliorates experimental lymphatic vascular insufficiency in mice. PLoS One. 2009;4(12):e8380. 117. Tian W, Rockson SG, Jiang X, et al. Leukotriene B4 antagonism ameliorates experimental lymphedema. Sci Transl Med. 2017;9(389):pii: eaal3920. 118. Damstra RJ. Upper Limb Lymphedema. In Lee BB, Rockson SG, eds. Lymphedema: A Concise Compendium of Theory and Practice. 2nd Ed. Springer International Publishing AG 2011, 2018; 540. 119. Földi E, Földi M, Rockson SG. Complete decongestive physiotherapy In Lee BB, Rockson SG, eds. Lymphedema: A Concise Compendium of Theory and Practice. 2nd Ed. Springer International Publishing AG 2011, 2018; 406.